This tool kit will provide state and local program administrators with information regarding the key components of work-based learning (WBL), an instructional strategy that enhances classroom learning by connecting it to the workplace. It offers guidelines and resources related to creating a state WBL strategy, engaging employers, collecting data, and scaling effective programs. Click to open Alignment of Classroom and Workplace Learning. Click to open Application of Academic, Technical, and Employability Skills in a Work Setting. Click to open Support from a Classroom or Workplace Mentors. 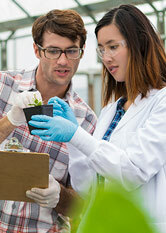 Recent research, policy literature, and federal legislation suggest that comprehensive WBL programs contain three key components: the alignment of classroom and workplace learning; application of academic, technical, and employability skills in a work setting; and support from classroom or workplace mentors. View the framework below, then scroll down to learn more about WBL in federal legislation and see references for the three components. Click on the main navigation sections above to view resources related to creating a state WBL strategy, engaging employers, collecting data, and scaling effective programs. Federal legislation references work-based learning (WBL) in the Carl D. Perkins Career and Technical Education Act of 2006 (Perkins IV), the Every Student Succeeds Act of 2015 (ESSA), and the Workforce Innovation and Opportunity Act of 2014 (WIOA). Click on the links to access the full text of the legislation, or read more below. Perkins IV references WBL in Title I, which specifies that federal funds must be used at the local level to support career and technical education (CTE) programs that provide students with industry experiences, including WBL. ESSA references WBL in three separate sections. In Section 1112, the legislation states that local education agency plans should describe support for WBL programs to provide students with exposure to industry professionals and the option to earn academic credit. Section 2103 includes professional development for teachers and administrators on WBL instruction as an allowable use of local funds. Finally, Section 4203 lists WBL as a possible indicator of career readiness at the secondary school level for the purpose of state applications for federal funds. WIOA mentions WBL in reference to Job Corps and Vocational Rehabilitation programs. 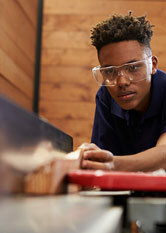 Section 148 describes WBL as a required activity of Job Corps centers, with WBL provided in locations that comply with occupational safety and health guidelines (Section 159). Additionally, Section 418 amends legislation on the use federal vocational rehabilitation funds for training and services for employers to include working with employers to design WBL activities for individuals with disabilities. Section 422 amends the description of pre-employment services for individuals with disabilities to include WBL as a required activity. The following selected references provide more information on the three WBL components and discuss the benefits of WBL participation more generally. Source: Jobs for the Future. 2016. This report provides an overview of WBL in a career pathways context, defines five types of WBL experiences (internships, co-ops, on-the-job training, transitional jobs, and apprenticeships), and presents seven principles for quality WBL. Source: National Skills Coalition and the National Youth Employment Coalition. 2016. This paper describes the benefits and challenges of four strategies for engaging youths in WBL: paid internships for disconnected youths, paid internships for at-risk in-school youths, paid community service opportunities, and youth apprenticeships. Source: Organization for Economic Co-operation and Development. 2016. 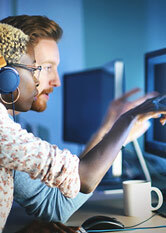 This report summarizes international research on the benefits of WBL for at-risk youths and provides policy recommendations for engaging employers based on an examination of the cost-benefit analysis for WBL. Source: WestEd for the James Irvine Foundation. 2009. This report describes the purpose and components of WBL, offers short examples of WBL in practice in California, and proposes strategies for sustaining and expanding WBL programs. Source: National Research Center for Career and Technical Education. 2013. This report provides an overview of the literature and findings from case studies on WBL at the secondary school level, with a focus on three types of WBL activities: internships/cooperative education, apprenticeships, and school-based enterprise. This tool kit was produced under U.S. Department of Education Contract No. ED-VAE-12-C0051 with RTI International Inc., which administers the Department of Education's National Center for Innovation in Career and Technical Education. Carolyn Lee served as the contracting officer’s representative. The views expressed herein do not necessarily represent the positions or policies of the Department of Education. No official endorsement by the U.S. Department of Education of any product, commodity, service or enterprise mentioned in this publication is intended or should be inferred. Please also note that this website contains information and resources from public and private organizations that may be useful to the reader. Inclusion of this information does not constitute an endorsement by the U.S. Department of Education of any products or services offered or views expressed. This website also contains hyperlinks and URLs created and maintained by outside organizations, which are provided for the reader's convenience. The Department is not responsible for the accuracy of the information contained therein. Click on the components to learn more. require training for instructors on how to integrate WBL experiences into curriculum and instruction. include in-depth and hands on work experiences (either on site or through simulated/virtual methods), with activities ranging from career awareness and exploration to career preparation and training. 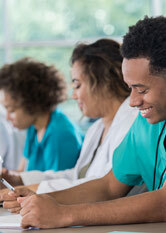 offer training for mentors on providing students with industry-specific support; general career and education guidance; personal and professional growth; and a caring, emotional connection.